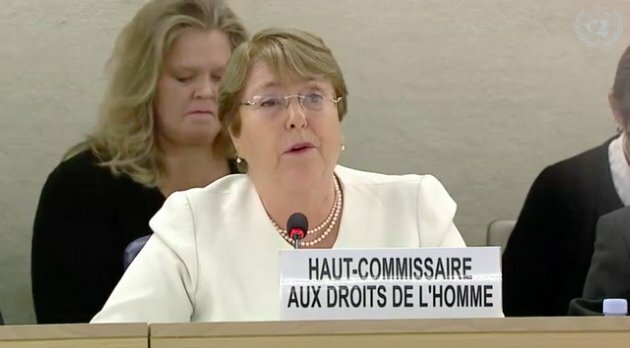 Michelle Bachelet, ex-President of Chile and recently appointed UN High Commissioner of Human Rights, gave her maiden speech on Monday at the Human Rights Council in Geneva, Switzerland. Between Jan. 1 and Sept. 1, 53 human rights leaders were killed in Colombia and 57 more are awaiting verification, she explained. In Mexico, eight activists were killed in the first eight months of the year, more than the entirety of 2017, a worrying situation which also extends to journalists in the country, of whom eight have been killed and one disappeared this year alone. Turning her eye to Venezuela and Nicaragua, El Nacional reported, Bachelet highlighted the massive flight of Venezuelans from their country and the similar – albeit less high-profile – situation in Nicaragua. It was also confirmed on Monday that Bachelet agreed to a meeting with Jorge Arreaza, the Chancellor of Venezuela to discuss the growing crisis in the Latin American country. Her speech also touched on the persecution of the Rohingya people in Myanmar and the allegations of re-education camps in China against the minority Muslim Uighur group who are undergoing arbitrary detentions and “forced political indoctrination.” Bachelet also condemned Trump’s policy to separate migrant families from their children, and voiced concern about the heightened immigration restrictions in Italy as a result of the influx of Syrian refugees. The countries mentioned in her speech have the chance to respond on Tuesday. The Human Rights Council started Monday Sept. 10 and will run until Sept. 28 in Geneva.